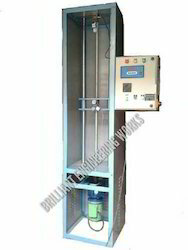 Prominent & Leading Manufacturer from Mumbai, we offer self oscillating monitor, portable oscillating water monitor, water powered self oscillating monitor, remote control monitor, trolley type portable oscillating water monitor and water self oscillating monitor. · The portable oscillating monitor is designed for a dual use of Ground Monitor as well as Deck Monitor with an optional oscillating monitor that can be deployed easily. · 2.5” Size double swivel inlet with locking mechanism for mounting and locking the oscillating attachment. · The unit is equipped with a vertical stop pull pin to limit its vertical movement to 30˚ for safety reasons. The vertical movement beyond 30˚ is possible by pulling the vertical stop pull pin. 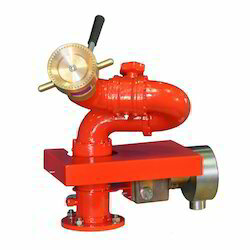 · The unit is equipped with a pressure gauge and is powder coated in RED. · Screw locks for securing the unit at desired Horizontal and Vertical position. 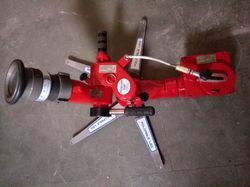 · The unit is equipped with an optional oscillating attachment which is mounted on to the double swivel inlet of the monitor through a locking mechanism. The oscillating attachment works on Pelton Wheel – Planetary Gear Mechanism. The range of oscillations is from 0˚ to 60˚. The oscillating mechanism avoids complex valve block design and any water lines exposed on the body of monitor. The oscillating mechanism has an oscillating arm to control the Degree of Oscillations. The frequency of oscillations is controlled through a locking gear on the Pelton Wheel. 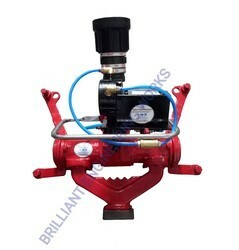 The mechanism is simple to understand, easy to operate and unobstructive to water flow. The oscillating mechanism works even when used with water containing solid particles. 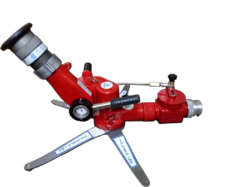 · Attachments like Ladder Pipes and Flanges for Stand post mounting is optional accessory available on request. Self-Oscillating Water Monitor Stand Post Type adapted to fit the 4-inch flange (150#) and barrel size 3". Water powered, oscillating mechanism, made out of Stainless Steel. Monitor made out of SS 304, with inlet flange of 100 NB (4 inch). GUN METAL /SS swivel joints with locking arrangements. 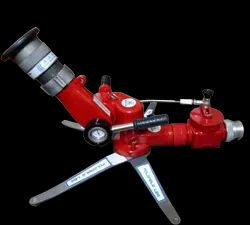 Permitting automatic adjustable ARC from 0-120 degree or more and manual 0-360 degree rotation, +80 to (-) 45-degree manual vertical movement. More than 50 M horizontal throw in still air. Monitor generally confirming to IS: 8442. 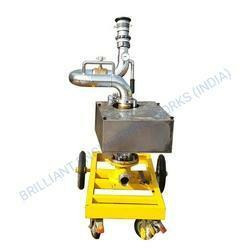 The entire assembly shall be hydraulically tested to a pressure of 21 Kg/Cm2 for 5 minutes without any leakage. Certificate of hydro testing shall be provided along with the delivery of material. Monitors shall be painted with fire red color confirming to IS: 5 shade no. 536 and the paint shall confirm to IS: 2932. We are a trustworthy organization in the market, actively engrossed in offering a wide gamut of Remote Control Monitor. Monitors shall be painted with fire red colour confirming to IS: 5 shade no. 536 and the paint shall confirm to IS: 2932. Self Oscillating Water Monitor # Stand Post Type, adapted to fit t4-inchnch flange (150#) and barrel size 3". Monitor made out of SS 304, with inlet flange of 100 NB (4 inches). Monitor generally confirming to IS 8442. Monitors shall be painted with fire red color confirming to IS 5 shade no. 536 and the paint shall confirm to IS 2932. 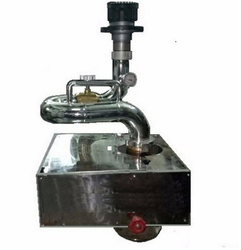 WE ARE MANUFACTURING SELF-OSCILLATING WATER MONITOR. 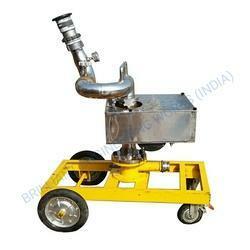 As per requirement of our Clients. Monitors shall be painted with fire red colour confirming to IS 5 shade no. 536 and the paint shall confirm to IS 2932. Oscillation 20 Degree To 120 Degree. Flow Rate: 750 To 4000 Lpm. Oscillating Mechanism: Water Turbine System. Oscillating Range: 60 To 120 Degree ( Adjustable) . Inlet: 2" , 2 1/2" , 3" & 4 "
2.5" Size double swivel inlet with locking mechanism for mounting and locking the oscillating attachment. 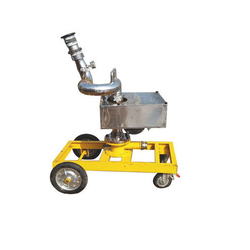 The unit is equipped with a vertical stop pull pin to limit its vertical movement to 30 for safety reasons. The vertical movement beyond 30 is possible by pulling the vertical stop pull pin. 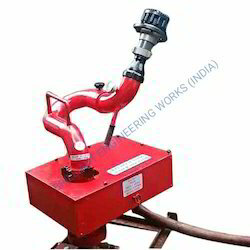 The unit is equipped with an optional oscillating attachment which is mounted on to the double swivel inlet of the monitor through a locking mechanism. The oscillating attachment works on Pelton Wheel - Planetary Gear Mechanism. The range of oscillations is from 0 to 60. The oscillating mechanism avoids complex valve block design and any water lines exposed on the body of monitor. The oscillating mechanism has an oscillating arm to control the Degree of Oscillations. The mechanism is simple to understand, easy to operate and unobstructive to water flow. The oscillating mechanism works even when used with water containing solid particles. assemblies and hose/hose fittings as per UL standards (Underwriters Laboratories). Looking for OSCILLATING FIRE WATER MONITOR ?